Now the project has attracted funding from the federal government, private companies and the city of Tallahassee. With Rutkovsky at the helm, plans call for a walkway raised above flood level and permanent lighting. Beyond that, the art professor says he hopes the community comes together to make the spaces what residents want them to be. And some of the grant money actually depends on that engagement. Tallahassee Policy and Program Development Administrator John Baker says both monetary support and physical help constructing the project are crucial. 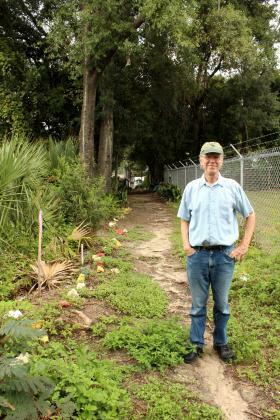 “We want it to be a place where community members can come and be a part of something that they have contributed to, whether it’s watering plants, whether it’s buying a brick, whether it’s planting the plants,” Baker says. At tomorrow’s First Friday gathering at Railroad Square, the city is launching a campaign asking people to purchase personalized bricks that will be part of the finished project. Rutkovsky says soon the alleys will be a much more inviting public space. “I want to invite the greater community to also be part of our events, from a wedding to a performance to showing drawings or paintings—more traditional work—as well,” he says. 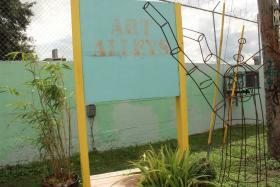 The Art Alleys transformation is expected to be complete by early next year at a total cost of more than $100,000. People interested in getting involved in the Art Alleys project can find out more here.